I spent two mornings this week out geocaching, one with f0t0m0m, one with him and Capdude. The first of the days we were in Simi Valley, the second in Santa Clarita. Both days were fun and relaxing, overcast and cool. The finds were mostly standard with a couple of really good camo jobs thrown in. We did not do any hiking per se, but did climb a couple of hills in open space or parks. We had lunch at decent restaurants, but nothing gourmet. We saw lizards, birds, and squirrels, but no unusual wildlife. We were unnoticed by muggles. We were not in a hurry, and our lists had only around a couple dozen for each day. I took a few pictures. We enjoyed the fresh air, the anticipation of each hunt, and the satisfying ritual of the log book. We got outside, and saw something new around every corner. I’d call it generic geocaching. This does not diminish the experience in any way, however. This is what we really enjoy: just finding geocaches and finding more and more of them. I’ve found 3 or 4 caches under this little bridge. It’s in a small valley amongst the homes that’s lace with walking paths. Until next week, happy plain-wrap caching! The second was in a park that I did not have time to explore. Both were about a half mile from my hotel, yet were the closest. There is no cache at the Price Tower, a significant Bartlesville landmark, designed by Frank Lloyd Wright. … and no trip is complete without sampling the best of the local cuisine, which here, according to our driver who bought us all some, is Braum’s ice cream! oh, and the kitten is now over 6 weeks old and eating out of a bowl – doing SO well! I was thinking I would only be able to get out for one or two geocaches this week, but I ended up doing a bunch. I did a short hike in Griffith Park with Eagle Rock Rob and a half day in Simi Valley with f0t0m0m, but I also did grab a couple in between errands, hence the title of this week’s installment. A new one appeared near Van Nuys airport near an industrial park. The cache is around behind where you can see the animals they have. The hike in Griffith Park was for a few in a new series, and I look forward to going back for more of them. They are all basic hides along the fire roads and trails, and are like breadcrumbs to show us the loops to take. January: A walk in the park. August: A walk in the park. September: A walk in the park. October: A walk in the park. November: A walk in the park. December: A walk in the park. I find that around 2 dozen caches is just about right for most urban caching days before I start to get fatigued. This number easily goes up or down depending on the density and/or quality of caches in an area, though. Sometimes 10 feels like a lot of work and other times 100 feels like I’ve just gotten started! The half day in Simi Valley involved a list of 24, it took 3 hours, and it felt just right. We ended up with 23 finds and skipped one that was way back on a bike trail. I’ll have to figure out how to access that one another day. Several were at entrances to the bike path along the arroyo, where you can see egrets and ducks. They were not being cooperative for my camera that day, but the creek view and the cloudy day were nice combo. Until next week, cache as cache can! A few of us were interviewed for this article and I got quoted at the end. What a great photo at the top! It’s a nice article, mostly correct, but it’s still quite disappointing to read that the state park official thinks that geocaches are buried. 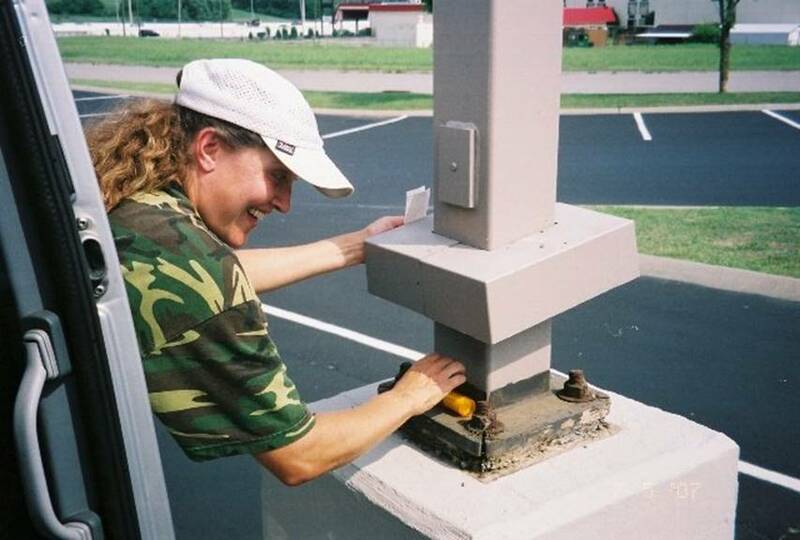 True geocaches are hidden, but never buried with a shovel. He corrects himself later, but it still comes off as confusing. The new restrictions for geocaching in state parks is a concern, and none of us are sure who we are supposed to ask now for “permission”. An even greater concern is that the legislature wants to close a lot of the parks. Common sense says that it would cost more to keep people out of a closed park, especially homeless and criminals, than to keep them open to the public. I’m feeling a big sense of frustration here on both counts. Here’s Bee Canyon, just north of O’Melveny Park at the north end of the San Fernando Valley. We saw this beauty along the trail, too! I rarely see snakes. This one is only the 4th rattler I’ve encountered while geocaching in 6 years. Until next week – watch out for snakes! Oh, the kitten is doing marvelously well, growing and eating, now just over 4 weeks old.